As HTML5 and XHTML are introduced, examples and exercises encourage students to create sample pages and gain useful experience. Students are encouraged to create sample pages as they read through the text. This chapter discusses the use of graphics and visual eff ects on web pages, including image optimization, CSS borders, CSS image backgrounds, new CSS3 visual eff ects, and new HTML5 elements. Students are encouraged to create web pages as they read through the text. This chapter focuses on recommended web design practices and accessibility. Some of this is reinforcement because tips about recommended website design practices are incorporated into the other chapters. This chapter continues the study of CSS begun earlier and introduces techniques for positioning and floating web page elements, including a two-column CSS page layout. New HTML5 semantic elements are also introduced. 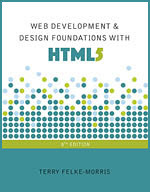 This chapter revisits earlier topics and introduces more advanced techniques related to hyperlinks, using CSS sprites, a three-column page layout, configuring CSS for print, and designing pages for the mobile web. CSS media queries are introduced as students configure a web page for both desktop and mobile display. This chapter focuses on the process of website development, including the job roles needed for a large-scale project, the web development process, and web hosting. This chapter introduces e-commerce, security, and order processing on the Web. This chapter discusses site promotion from the web developer's point of view and introduces search engine optimization.